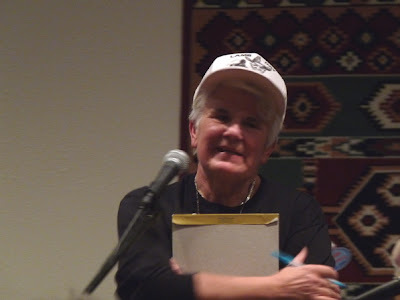 The Protect Snake Valley website and blog were started due to the threats of Southern Nevada coming into Snake Valley to dewater it. The loss of massive amounts of groundwater in the valley would have far reaching consequences, drying up springs and streams, killing off vegetation that had roots reaching down to that water, potentially creating huge dust storms due to unstable soil. Many people have been fighting to help preserve the wild, unique character of Snake Valley, from the valley bottoms to the mountain tops. This week a legal victory has given our side something to cheer about, and hopefully will help us as we continue to fight. The Nevada Supreme Court said that people who wanted to protest the Spring Valley water applications by Southern Nevada Water Authority were not given the chance that they should have been. The applications will have to be refiled or anyone who wants to protest them will have to be given that opportunity. This basically means that the State Engineer's ruling on Spring Valley (which is just over the hill from Snake Valley), will have to be looked at again in great detail and possibly a new hearing held. The results of this hearing could be very different from the first one. The issue is far from over, though. Southern Nevada Water Authority is still trying to get water from rural Nevada. They refiled applications yesterday and still plan to pump and pipe water hundreds of miles to the seemingly unquenchable thirst that exists in southern part of the state. Nevertheless, it is good to see that our efforts are producing results and even more people are questioning the sustainability of this nefarious pipeline scheme. If you'd like to read more, you can find the latest news articles linked on the Great Basin Water Network website. 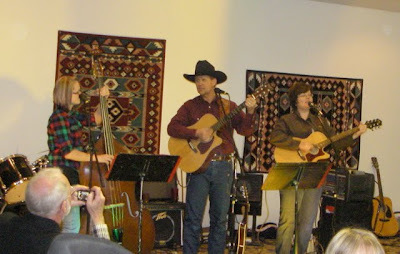 The 2010 sheepherder's gathering was the biggest one yet, and it appeared everyone had a great time! Activities began Friday night with an appreciation dinner. 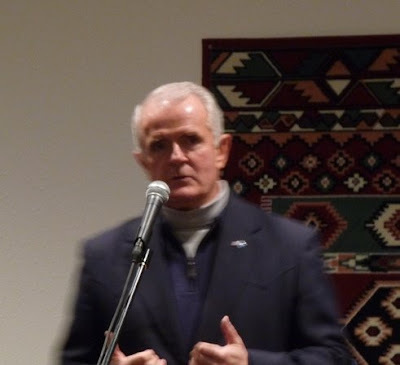 Denys Koyle, co-owner of the Border Inn, kicked off the program afterwards. 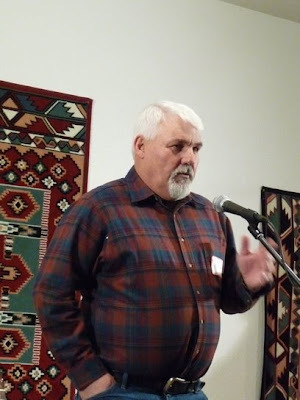 Then Hank Vogler took over as emcee, sharing his witty repartee between speakers. Having spent a large part of his life working with sheep, he had no shortage of stories to share. 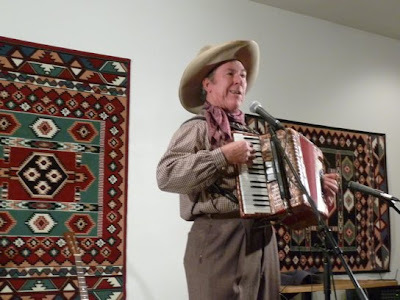 Sourdough Slim shared his musical talents and country sense of humor. 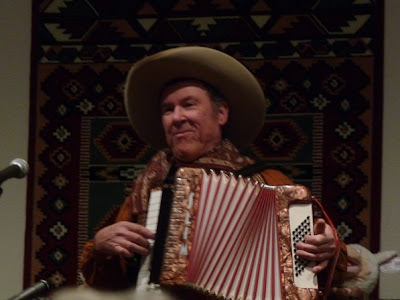 He makes it look so easy to play multiple musical instruments at the same time, sing, tell jokes, and keep a crowd of varying backgrounds and ages entertained. 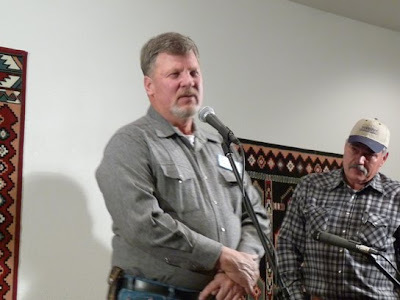 Then it was time for speakers to get up and share stories about sheepherders, sheep shearers, and sheep owners. I was able to photograph most, but not all the speakers. 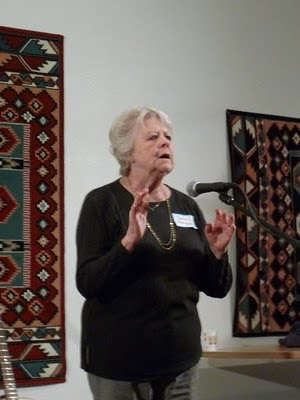 Fortunately the entire program was videotaped for the Great Basin National Heritage Area, so in the future it should be available for those who are interested. 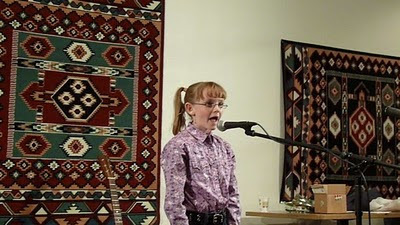 Little Melanie sang a song to conclude the speaker part of the program. She is quite brave to get up in front of a crowd! Then Sourdough Slim performed some more musical numbers. There were so many people in the room that some had to stand in the doorways in order to be able to watch. The next day was the sourdough pancake breakfast in the morning, video clips and movies about the Snake Valley area, and another performance by Sourdough Slim in the afternoon. 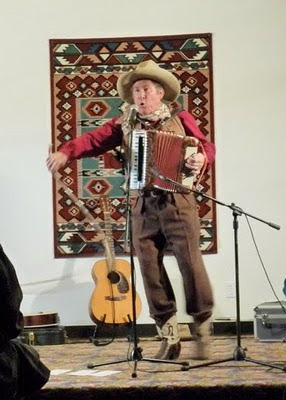 He did his accordion playing, yodeling, dancing, rope trick to the delight of the crowd. In the evening was a delicious lamb and beef family-style dinner. It was fun to meet people from a variety of backgrounds. During dinner the Silver Sage band performed, and afterwards they played late into the night for those wanting to dance. Overall it was a very successful weekend and a great opportunity to get out of the house and beat those winter blahs. 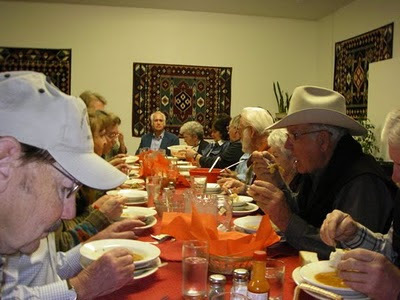 This was the seventh annual sheepherder's party--we only have a year until the next one! It's almost time for the annual Sheepherder's Gathering at the Border Inn! Thousands of sheep are out on the range, and the sheepherders, sheep owners, and sheep aficionados are ready to take a break from their isolation and gather for a weekend of fun. 2 PM - Sourdough Slim returns! See below for a little more info on this fun show, great for kids. Call 775 234-7300 for more info. 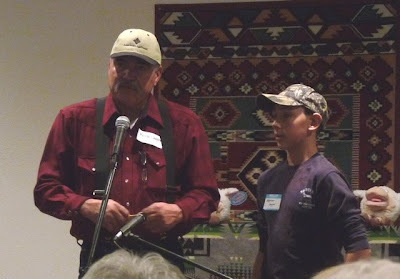 Below is the blog post for the 2009 Sheepherder's Gathering. As you can see, it was a really good time, so make sure you don't miss this year's! The Sheepherder's Party was recently held at the Border Inn, located out on the Utah/Nevada stateline. This area, generally called the West Desert, has been a big winter sheepherding area for over a century. This party is put on to encourage sheepherders, sheep owners, and others involved in the sheep industry to celebrate their heritage and to take a break from the mundane routines of winter. Denys Koyle, owner of the Border Inn, organized the event, which went from Friday evening to the wee hours of Saturday night. 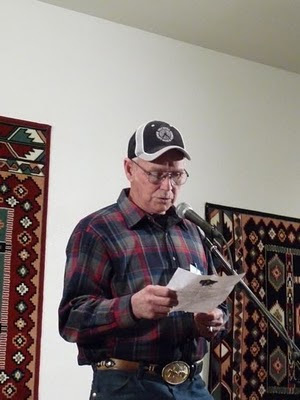 Friday night was a dinner and sheepherder's stories; Saturday was a pancake breakfast, presentation by Sourdough Slim, a dinner, and the sheepherder's ball, with lots of good music to kick up your heels to. In addition, the Great Basin National Heritage Route conducted oral histories, Great Basin National Park opened the new visitor center with recently installed exhibits, and some folks took a water tour to learn more about Snake Valley. 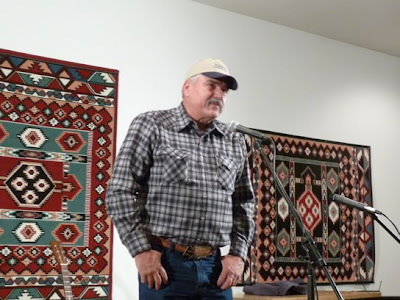 Nevada Governor Jim Gibbons opened the program Friday evening with remarks. 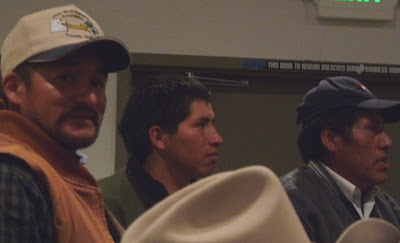 Some of the actual sheepherders came. There aren't so many of them anymore as transportation has improved. 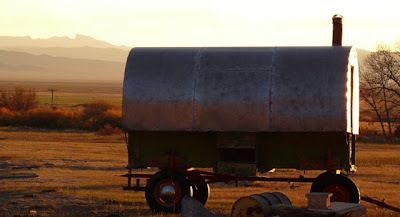 Nevertheless, they still do a lot of the sheepherding the old-fashioned way, living in small sheep camps, riding horses to move the sheep, and having only their border collies and sheep dogs for company most of the time. At one point most of the sheepherders were Basque, but today they are all from Peru. Sourdough Slim showed off his excellent musical abilities and sense of humor. 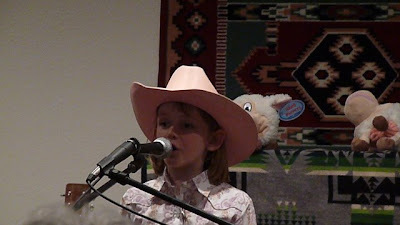 The program included those of all ages, including young Melanie singing a pretty song in her pink cowgirl hat. 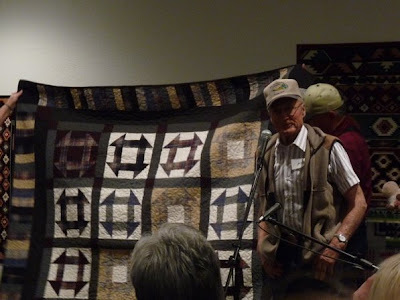 This gentleman showed off a quilt his made. He explained that he wore the elbows out of his wool shirts, and they would mysteriously disappear from the closet. He wanted his wife just to cut the sleeves off to make short-sleeved summer shirts, but she used them to make this beautiful quilt--her 100th quilt! 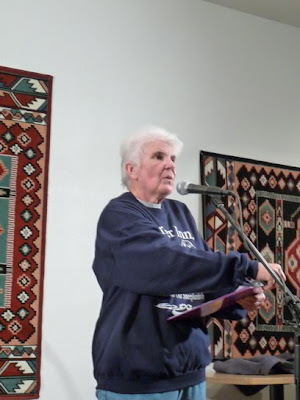 The emcee was the garrulous and hilarious Hank Vogler. His son got up to take his turn at filling the room with hot air. And then came something new for me: cowboy yodeling. I really enjoyed it. 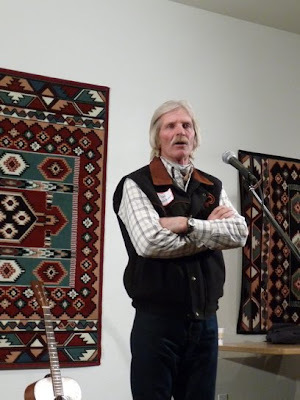 If you want to hear more, Sourdough Slim will be performing at the National Cowboy Poetry Gathering in Elko, Nevada the end of January, or you can get CDs from his website.